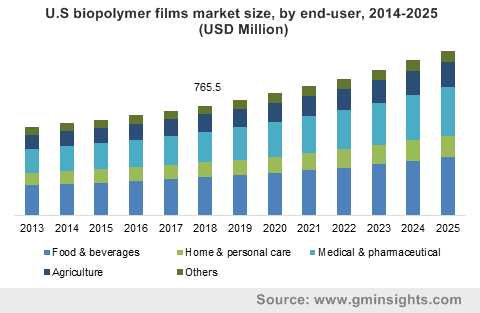 Biopolymer Films Market size was valued at over USD 4.12 billion in 2018 and will witness gains over 7% CAGR by 2025. Biopolymers films market is mainly driven by flourishing food and beverage industry especially in developed nations including the U.S. along with escalating food packaging demand for extended preservation has substantially propelled the overall biopolymer films market size over the forecast time spell. Biopolymers are derived naturally from organic sources such as plant proteins and starch and are easily degradable by the action of micro-organisms when exposed to moisture and heat. Bio based plastics and biopolymers have been widely used due to their ability to replace oil-based packaging materials with bio-based films & containers, that might give not only a competitive advantage due to more sustainable and greener image, but also some improved technical properties. The overall food & beverage business in 2005 was roughly around USD 8 trillion and this has likely reached almost USD 16 trillion in 2018. This inclination was particularly driven by growing population along with increasing restaurant & food joints visits of middle-class population in Asia Pacific and Latin America, on account of increasing consumer spending power in these regions. The growing focus towards sustainable development, implementation of strict environment regulations to reduce carbon content, fluctuating fuel prices and limited availability of petroleum resources is expected to create lucrative opportunities for bio-based plastics and polymers in the coming years. Besides various advantages offered by the product. High production cost in contrast to synthetic films is one of the major pitfalls faced by the biopolymer films market. Relatively low vapor barrier and mechanical properties of the product will likely affect industry growth. However, technological advancements such as atomic layer deposition and multilayer films has introduced optimistic growth of products with promising characteristics. The aforementioned trends along with increased focus on sustainable packaging by brand owners and retail companies will drive the market demand for biopolymer packaging, thus creating new industry growth prospects for biopolymer films over the projected timeframe. On the basis of raw material, the global biopolymer films market has been segmented into bio-based, partially bio-based, microbial synthesized, and synthetic. Based on volume, bio-based will hold the maximum share of over 40%. Prolific availability of these resources such as chitosan, pectin, cellulose, protein, and starch will augment the global biopolymer films market share over the estimated timespan. Pectin is a structural heteropolysaccharide found in the primary cell walls of terrestrial plants such as sugar beet. Its ionic interactions have a great impact on its film forming properties and behavior in dispersions with e.g. nanoclays. Based on revenue, microbial synthesized biopolymer films will experience promising gains with over 7.5% CAGR by 2025. Major raw material used in the segment includes polyhydroxyalkanoates (PHA) and polyhydroxybutyrate (PHB). Superior barrier and mechanical properties provided by these raw materials-based films is the major factor propelling industry growth in this segment. Microbial synthesized are obtained generally by structural, intracellular and extracellular microorganism synthesis. On the basis of technology, the global biopolymer films market is categorized into sol-gel, atomic layer deposition (ALD), and multilayers. Multilayer films led the overall industry size and accounted approximately half of the overall volume share in 2018. Multilayer films are widely acceptable in the industry since they can be utilized as a packing material for dry or low moisture content food products like dried fruits, dry snacks, nuts, spices etc. The global biopolymer films market size by atomic layer deposition (ALD) shall observe growth over 7% between 2019 and 2025. This technology is a surface-controlled layer on layer deposition process by solid reactions and self-emitting gas. This technology is widely used in PHB and PLA films to enhance their antimicrobial and water vapor barrier characteristics. On the basis of product, the global biopolymer films market is segmented into PLA, PHA, PHB, PVA, polyamide, mulch, cellophane and others. The others segment includes Poly (Hydroxybutyrate-Hydroxyvalerate) (PHB/HV) and poly- e-Caprolactones (PCL) etc. Among these, PLA biopolymer films market share accounted for over 25% of the industry share in 2018. The product finds widespread applications in the packaging and food industry. They are used in disposable tableware, food packaging, compost bags, and loose-fill packaging. Strong growth indicators in these industries will subsequently boost the overall industry size in the near future. However, critical points related with the product such as low thermal resistance and low impact resistance may hinder the business growth by 2025. The global PHB biopolymer films market share is likely to witness decent growth rate of more than 7.5% between 2019 and 2025. PHB is biosynthetic in nature with significant characteristics such as non-pollution causing polymer, temperature resistant, durable and biodegradable. It offers advantages equivalent to conventional petrochemical based films and is completely biodegradable. In addition, it is entirely nontoxic. Favoring government regulations such as FDA for non-hazardous food packaging materials will favorably influence the overall industry growth during the forecast spell. 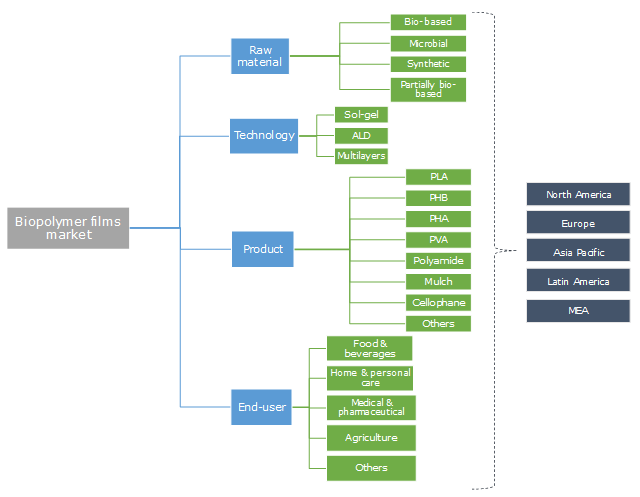 The global biopolymer films market has been segmented on the basis of end-user into food & beverages, home & personal care, medical & pharmaceutical, agriculture and others. The others segment includes pet food & care, tapes, etc. In 2018, food & beverages segment held a prominent share and accounted for more than 40% of the global biopolymer films market share. These films are used to conserve frozen poultry and it is subsumed into gelatin coating in order to decelerate the growth of oxidative rancidity in cut poultry meat before freezing. Increasing demand for bio-based food packaging materials particularly due to stringent legislations laid by EPA and FDA along with growing consumer awareness regarding biodegradable product will stimulate industry size in the near future. The global biopolymer films market size for agricultural applications is likely to observe gains at more than 6% CAGR by 2025. These films are generally used for mulching, irrigation purposes and greenhouse components. In recent years, these films are being incorporated in synthetic plastics and glass substitutes in agriculture applications in order to reduce adverse environmental impacts. This trend is projected to boost the overall industry growth during the forecast spell. Based on revenue, North America led by the U.S. biopolymer films market size was more than USD 1 billion in 2018. The regional growth is mainly attributed to robust product demand for food packaging application. The U.S. is one of the major packaged food industry share contributor. Thus, the region holds significant product demand. Furthermore, prevalence of strict norms formulated by FDA in the U.S. for food packaging applications will substantially boost the regional industry size by 2025. Asia Pacific region is a key contributor and is forecast to observe maximum gains between 2019 and 2025. The region will witness significant growth opportunities particularly due to increasing product demand for food and medical applications. Increasing consumer spending pattern towards food, beverage and cosmetics will further complement regional growth over the estimated timeframe. 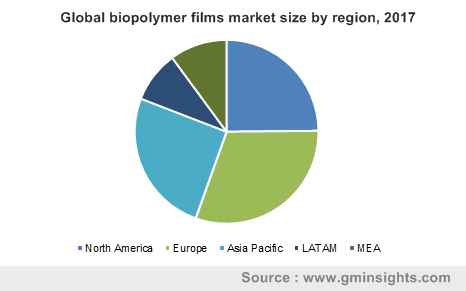 The global biopolymer films market share was highly fragmented with the presence of various small, medium and large-scale product manufacturers. Some of the prominent players operating in the industry includes Avery Dennison, BASF, Amcor, Braskem, Evonik, Mondi Group, Innovia Films, Plastic Union, Toray Industries, Taghleef, NatureWorks, Industria Termoplastica Pavese, BioBag International, and Klöckner Pentaplast. Industry players rely on extensive R&D to enhance the product portfolio based on the end-user demand. Also, abundancy of raw materials for product manufacturing tends to encourage new market entrants. Strategic and commercial partnerships for technology advancements, product development, and strengthening the market hold characterizes the global biopolymer films market competitive landscape.